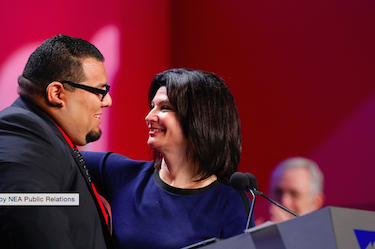 Jose Lara, a prominent leader of the LA teachers union, UTLA, was recently named the 2015 Social Justice Activist of the Year by the National Education Association (NEA). Lara helped lead a successful grassroots effort to get the LA Unified school board to adopt ethnic studies as a graduation requirement. He is vice president of the El Rancho Unified School Board, dean at LA Unified’s Santee Education Center and a member of the UTLA board. Lara received the award Sunday at NEA’s Representative Assembly in Orlando, Fla., which was attended by 7,000 members. The award honors the member who “demonstrates the ability to lead, organize and engage educators, parents, and the community to advocate on social justice issues that impact the lives of students, fellow educators, and the communities they serve,” according to the NEA. Lara led several rallies and protests outside LA Unified headquarters in the fall as leader of the Ethnic Studies Now Coalition, and spoke before the board in November when it voted to approve the new graduation standards.